Performance Time: Approximately 120 minutes, 76 pgs. GOTHIC HORROR. Sick of those cheesy Hollywood versions of Dracula with stock characters and silly plots? This adaptation of the Bram Stoker classic preserves the psychological terror and complex characterization of the original Victorian gothic novel. 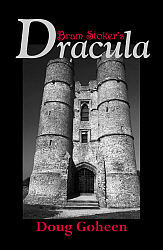 Jonathan Harker, a young lawyer, travels to Transylvania to transfer real estate in England to Count Dracula, but soon finds himself a prisoner in the Count’s castle. With Jonathan locked in the castle, Count Dracula travels to England to claim his new property. Not having heard from Jonathan in several weeks, his fiancée, Mina, anxiously awaits news of his return as she tends to her friend, Lucy, who has become weak with a mysterious illness. Mina notices Lucy’s propensity to sleepwalk and finds two small holes in Lucy’s neck. Unable to diagnose Lucy’s illness, Dr. Seward, the overseer of a sanitarium, wires his mentor Dr. Van Helsing for help. Upon examining Lucy, Van Helsing is convinced a vampire is the cause of her illness and sets out to convince the others to destroy Count Dracula before it is too late. The strong ensemble cast and the captivating, enigmatic Count Dracula will leave audiences spellbound.